After moving my things in and getting used to the idea of being a farmer, giving the property a name that would identify who I was felt like the next logical order of business (besides having 30 head of cattle delivered in the third week I was here; hey, I was eager to get going, even without a name!). I wanted the farm to have a name that would pay tribute to the settlers of this land, describe the animals that would be raised here, and to be different from the rest of the topographically and weather related farm names like Windy Creek or Stony Hill (no offense intended, they are fine names indeed, just not unique enough for me). 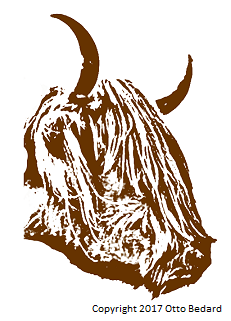 I knew that Highland cattle and Tamworth pigs would be the mainstay of the farm, along with other heritage breeds known as being hardy yet gentle, and easily adapted to the harsher climates of Canada. I wanted the word heritage to be incorporated into the name as a reflection of what I planned to do on this farm, my goals for the property, and as an acknowledgement that I had inherited something truly special here (See the Page: Why Asselstine Road for more on that). It only seemed right to name the farm something with purpose. "Heritage Farms"? Way too common. I knew early on that this farm would be different from most around (see Page: Why We Are Different if you want to know why), so why pick a generic name? After weeks of pondering and googling names, I decided to bow to the history of the British Isles, taking note of the cultures that not only influenced that land but forever changed it's history as well. Cultures that raised breeds of livestock without altering their genetics, keeping the bloodlines as pure as they could. This ensured hardier and more resistant livestock with less need for inputs from outside sources. These breeds are the truest and most honest form of livestock and luckily flourish in our cold Northern climates. Coming across French I decided to give some words a try... Le-Pre? Meaning pasture...it didn't sound in English the way I thought that it might, but I was getting somewhere now and decided to keep searching. I had a feeling that french would be the answer, so I tried looking up Heritage in Irish and French, but nothing was hitting me quite the way I wanted it too. Some words were just too similar to their English equivalent, like heritage, spelled the same in both languages. I knew once I heard it, the name would just pop. I had to keep trying, something would sound right. 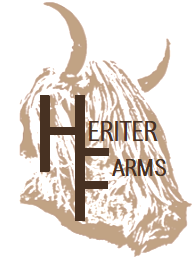 Lo and behold, NOWHERE on the internet was there a "Heriter Farms". I triple checked the popular search engine results, cross-referenced the name to links on the web, scouring the internet just to make sure it hadn't already been chosen. Nothing came up besides definitions of the word. It was mine! I immediately scooped up the domain before the moment had passed and haven't looked back since. A name that was memorable and yet easy to say. That would speak of my passion for keeping things simple, and my desire to get back to the roots of it all. To farm with the yearning of long ago days. and be thankful of their giving of life for your feast." Merriam-Webster Dictionary (2017). Heritage. Origin and Etymology of the Word Heritage. Retrieved from https://www.merriam-webster.com/dictionary/heritage on Oct 24, 2017.